Want to clean the foreign matter of ear? 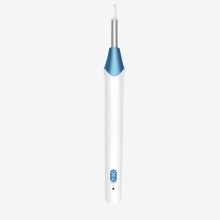 Want to clear the earwax with the magic earpick? Try our Wifi Ear Cleaning Earpick Endoscope! It can not only check the ear canal, but also check the eardrum, mouth, gums, throat, nasal cavity, hair roots and other body parts. With an electronic micro camera, you can observe the whole process of earwax in real time on your phone via wifi. Ultra-small lens, high-definition pixels, easy and safe to enter the ear canal, looking at the digging yourself. There are 6 LED lights that provide a light source that you can see more clearly in the ear canal. Medical endoscopes are near-focus products that can be blurred when shooting too close or too far. The best focal length is about 14-20mm. Multi-functional, it can not only check the ear canal, but also check the eardrum, mouth, gums, throat, nasal cavity, hair roots and other body parts. Wireless integrated Wifi connection for easy connection and use. Small size, light weight and easy to carry. Video frame rate: up to 30 F / S.
Photo: Software or photos on your phone with anti-shake? 1. Due to differences between different displays, the picture may not reflect the actual color of the item. We guarantee that the style is the same as shown in the picture. 2. Due to manual measurement and different measurement methods, please allow 1-3cm deviation. Thank you! 3. Since the normal working chip will have a slight fever, the hottest temperature is 30 degrees, it will not affect the ear canal, please feel free to use?